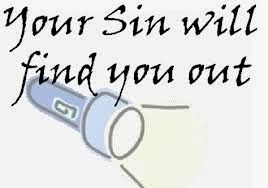 “But if you fail to do this, you will be sinning against the Lord; and you may be sure that your sin will find you out. In Youth group tonight we talked about sin and how it is always wrong even if nobody finds out. One of the young ladies said : somebody will always find out and even if nobody does God knows. As I was coming home for church and was thinking about the lesson it reminded me of this story I had read. In the days when pirates sailed the Spanish Main, the British warship Sparrow suspected the brig Nancy of carrying contraband and stopped it off the coast of Haiti, An examination of the latter's papers and cargo yielded only circumstantial evidence. Nevertheless, the captain of the Sparrow deemed this sufficient for him to tow the Nancy into Kingston, Jamaica, and charge the captain and crew with transporting illegal cargo. Meanwhile, the officer in charge of a tender of the British frigate Abergavenny, which happened to be cruising in the same waters, noticed a school of sharks feeding on a dead bullock. He decided to see if he could catch one of the predators for sport and ordered his ship to pull up alongside the dead animal. The sailors succeeded in hooking one of the sharks. Hauling the shark aboard, they opened it up and discovered in its stomach a bundle of papers. Examination showed that these belonged to the Nancy. Convinced that they might serve a useful purpose, the captain set sail for Kingston. The Abergavenny arrived in port not long after the case of the Nancy came up for trial. The latter's captain and crew, and even her lawyers, were sure the case would be thrown out of court for lack of evidence. But what must have been their consternation when they were suddenly confronted with the papers found in the shark's belly. Instead of being acquitted, they were convicted. Dear Lord, we thank You for being a forgiving God. Today we pray that we would not fall into sin but instead be strong and stand against the temptation. In Jesus’ Name, Amen.